I received this event poster in my email the other day. All the info about the Seedy Saturday event in Creston for 2012. As usual it is at the New Life Christian Church just east of the high school on Elm in their basement. There will be seeds to trade, pick up and to purchase. Local farmers are encouraged to bring in their products as well. There is no charge to get in as there is no presentation this year. The college is instead offering 2 classes in seed saving one in May and the other in the fall at the college itself. If there is any specific questions or information you want covered at the classes please send me an email. It seems it is my turn to lead this class. Brenda, Karen, Dan, Holly and others have all had a turn and with Holly moving.... Oh boy. I've been busy laying out an outline and thinking of ways to present the materials with photos and hands on activities. Any ideas are appreciated! Any favourite seed saving resources? I am trying to put together a good collection of handouts for participants and am going to bring all the seed saving books that I refer to. It is nice to see what is out there before purchasing anything. 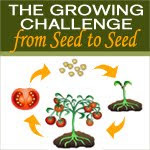 Anyways ... Seedy Saturday, Creston, 2012, March 10, 1-4, New Life Christian Church, 1821 Elm Street. - Heritage Harvest in Manitoba, because if it can grow there it's going to love it here! Tanya and her crew are amazing. - West Coast Seeds, as our weather in the spring is behaving more and more like the coast. I do find their germination rates disappointing though, just a heads up on that. - William Dam Seeds, good seeds, good folks. So the seed order is ready, lots of new varieties to trial and see how they do in our climate. Lots of new tastes and textures to try to describe and quantify. - If there are any holes that need plugging. The grid for each vegetable will quickly show me where we are missing any variations. Is there a good balance of pole/bush beans, enough green? enough yellow? dry? Are the main classes of lettuces being represented each year? Plug those holes! - Where we are expanding our offerings. We started seed saving with tomatoes, added beans, then lettuce, last year peas.... Each year there is an expansion, slowly. Not biting off more than we can chew. Only so many hours in the day.. You know. The learning curve can be steep, baby steps keep it from being overwhelming. It easier to reassess with small changes. Last year we tried cucumbers, they need tweaking before we're ready to share. There had to be a balance between the market garden and the seed garden and it didn't; balance that is. So we try again, differently. - Anything that didn't work the previous year that deserves a second shot. See 'cucumbers' above, for one example. The other, Early Riser Pole Beans, that didn't, rise that is (or grow at all). The Speckled lettuce that didn't germinate, the beans that didn't grow that much seed that probably needed to be watered or maybe weeded ;-) The rare varieties that are being accustomed to our climate and are improving each year, that still need more improving, showing promise just aren't quite THERE yet. - Certain varieties that we plant every year regardless of the 3-year rotation as dh uses it in his market garden annually. Ones that he would have a snit fit if we ran out of fresh seed for. The tried and true canners that sell so well at the market. The variety of large tomatoes that he is improving each year for the largest tomato competition at work. The ones we grow seed for to keep our seed orders from braking the bank. The plan this year is for 2000 tomato plants in his garden alone, you can see why it is better to grow our own seed for this. And now that that chore is done, and it is sunny, I'm off to clean the last of the lettuce seed. And we did finally harvest our seeds. The descriptions won't be ready for a while but I can give you a basic list of what we should have available at the Seedy Saturday event and at the Spring Farmers' Market. Some things are going to have to change this growing year. 2011 was the first year I planted seed production plants out at the farm instead of at the house. It is quite different. The lettuces need to be planted closer to home and I just need to get out there more often. The poor lettuce seed is still awaiting winnowing, can you do that inside? Hmmmm..... well I'm not doing it out in the freezing rain so it may have to wait the final stage of cleaning till spring. The worst joke on us was having all of our straw mulch sprout into thick plantings of oats. What had been planned as a way to reduce our weeding time actually increased it dramatically! The peas turned out really well and we enjoyed munching on the various types. Our favourite? Let's just say the 'Amish Snap', they are all mine, no one can have any seed ... or pods. Mine. The beans, well since we never really did get the water into their section, when I say 'drought resistant' or 'performs well in drought conditions' it's been proven. Some of the varieties were amazing! Others, hmmmm, some didn't come up in the cold wet conditions during planting and some didn't do well without water. Those aren't on the list above! Tomatoes grew well and we have some new favourites. I still hate cleaning cherry tomato seed but those 'Gardeners' Delight' are worth it! One other variety gave us 25 lbs. of beautiful red globes off of only 4 plants. This area was also on the dry side this year so that was very impressive. Knowing me, I will plant too many tomato transplants for our needs and will have the extras for sale once we have planted out ours. Mid-May let's say, so you can look forward to seeing those at the market. It is that time again, Farmers' Market Season is here! We did a booth featuring our lettuce and bean seeds as well as some extra tomato transplants. Here is dd Kait with df Karine, who sheltered us from the rain in her baking booth. Helpful children were helpful. Happy children were happy. Happy customers were happy too. Nothing like scoring some heritage open pollinated tomato transplants for the homestead. We'll be there again next week, 8am til noon on Saturday. Hopefully the weather will be nicer, less chilling wind and rain, more warmth!! Oh, please, more warmth! I have a seed problem, they started out so small and cute. Then they grew. And needed more space. Oh my. It wouldn't really be a problem but it has been SO cold and our last frost date is a good month away yet. This year's tomato seedlings are not going to be seedlings by the time they can be planted out. I'll be lucky if they aren't fruiting at this rate. That's what I get for forgoing the commercial seedling mix and planting in straight homegrown compost. My giddy aunts. Our local town council does not currently allow for chickens or for bees. We would like to see that change. So if you are from Creston BC and would like to join us in this endeavor let us know! The Kootenay Local Agricultural Society will be hosting its AGM at the COTR greenhouse classroom, Sunday March 27 from 1-3pm. I've been asked to bring the seeds and set up a table at the after-meeting open house. For more information see the KLAS website.